Check back this weekend, I'll have an expanded history of the lot posted here, including a lot more details on the old toll house (I'm limited in # of words in the newspaper, but on here I can ramble on in as much details as I like!). Just a tiny article buried deep inside the Journal on a Friday in 1906, but it represents such a significant milestone for our area. So to clarify the mentioned locations a little bit, Ottawa West was the original Cowley subdivision created in the 1890s between what is now Western and Rockhurst, and bordered by Scott and Wellington. Cleary's was a popular hotel on Richmond Road operated by Daniel Cleary for more than 30 years from approx. 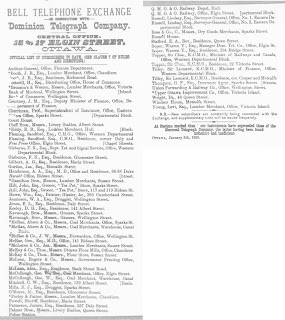 1880 until 1910 (in the vicinity of Cleary Avenue; incidentally, Daniel was the younger brother of Glebe real estate trader and politician Thomas Clarey, and in numerous records both brothers go by the alternate spellings of Clarey and Cleary. Both had streets named for them, but with the two different spellings!). And thirdly, "Woodruffe" of course is an early spelling of what is now Woodroffe. Telephones would have likely been located in the post office or general store of each of the two mentioned communities. In 1906, the Ottawa West post office was located in the toll gate office on Richmond Road operated by toll keeper Erasmus Duke, and makes for a logical location for the community's first telephone. 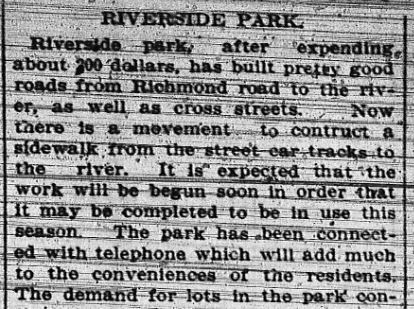 So 1906 really was a year of advancement for the west end of Ottawa, with the important arrival of the telephone. This got me thinking about when the telephone was first introduced to Ottawa as a whole. So I started searching around on the net, and found a few details about it, and thought I'd include a few tidbits of trivia on the subject. 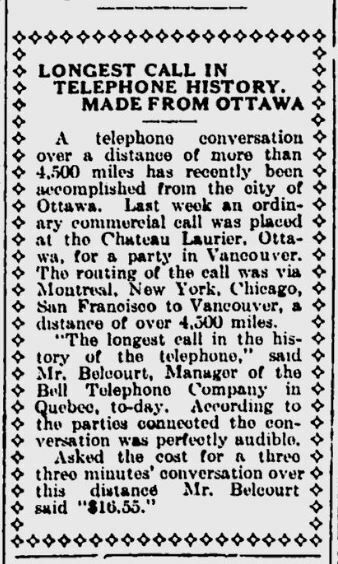 So the telephone's introduction to Ottawa is linked to Alexander Graham Bell as you may have guessed, but not as directly as you may have expected. In the mid-1870s, Bell had turned over his Canadian patent rights to his father Alexander Melville Bell, who then began promoting the telephone in Canada for the first time. Alexander Jr. had made the first telephone call on March 10, 1876 from one room to another within a house in Boston, Mass. It was just a year later that the telephone was first brought to Ottawa in 1877, by William S. Pettigrew, who had met the senior Bell on a boatride from Montreal to Ottawa (side note: when was the last time you heard of someone taking a boat ride from Montreal?). The two men of Scottish backgrounds became instant friends, and Pettigrew became Bell's agent in Ottawa. Thus in September of 1877, Pettigrew made the first public demonstration of the telephone at the Ex (then known as the Ottawa Agricultural Exposition). introduced in Ottawa in 1877. The first usage of a telephone in Ottawa came shortly afterwards, when Prime Minister Alexander Mackenzie had Pettigrew install a private line between his office downtown at the Public Works building near Parliament Hill to Rideau Hall. Ottawa historian Harry Walker wrote that the PM's secretary William Buckingham was responsible for testing the first call. Located at Rideau Hall. He described the moment: "...this impersonal box-like thing made him nervous. Finally from out of the box came a voice. It was the Prime Minister making contact from his other office in the West Block where he doubled as Minister of Public Works. Buckingham was thrown off stance by having to talk into a mouth piece before what he knew would be a listening group of Cabinet Ministers. In his braid Scotch burr, the Prime Minister instructed Buckingham to say the Lord's Prayer. Buckingham botched it. The Presbyterian Prime Minister...told Buckingham to listen while he repeated the Prayer for Buckingham's benefit. Buckingham was relieved, but only momentarily, for Mackenzie would not let him off the hook insisting that he try it a second time. The reluctant secretary was better on the second try. Then the whole room of guests heard the Prime Minister admonish the hapless secretary: "You have got it all right now, Buckingham, but don't you ever forget it again." 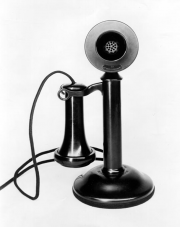 Then the Prime Minister formally opened the first telephone service in the Capital by talking with the Governor General. What they said to each other over a copper wire never made the record. But Buckingham's bumbling recital of the Lord's Prayer lived in history as it deserved to." 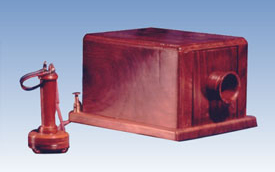 These first wooden box phones were not overly popular, due to the fact that user had to speak in to and listen through the same opening, and often parts of conversations were lost. 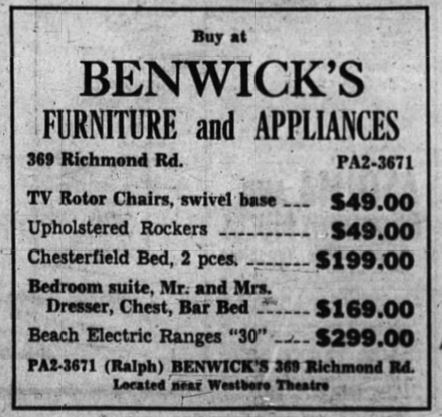 An Ottawa Citizen article in 1961 recalled the initial dissatisfaction in early phone service: "Mr. Pettigrew recalled that the telephone did not always work very well and the Prime Minister wanted it removed. However, music was invariably transmitted successfully and Lady Dufferin would sing and play the piano at Rideau Hall and the music would be heard distinctly in the departmental building, two miles away. And at the Ottawa end, Captain Gourdeau would sing for the edification of Lady Dufferin and Rideau Hall. Lord Dufferin countermanded the Prime Minister's order and the telephone stayed." The Bell Telephone Company was created in November of 1880, combining the two competing upstart telephone systems which had been established earlier in the year (the Dominion Telegraph Company, managed by Warren Soper, and the Montreal Telephone Company, managed by Thomas Ahearn). Ahearn and Soper would go on to manage countless organizations in Ottawa (they formed the Ottawa Electric Company, the Ottawa Electric Railway, the Ottawa Land Association, etc. ), and are arguably the most influential businessmen in Ottawa's history. 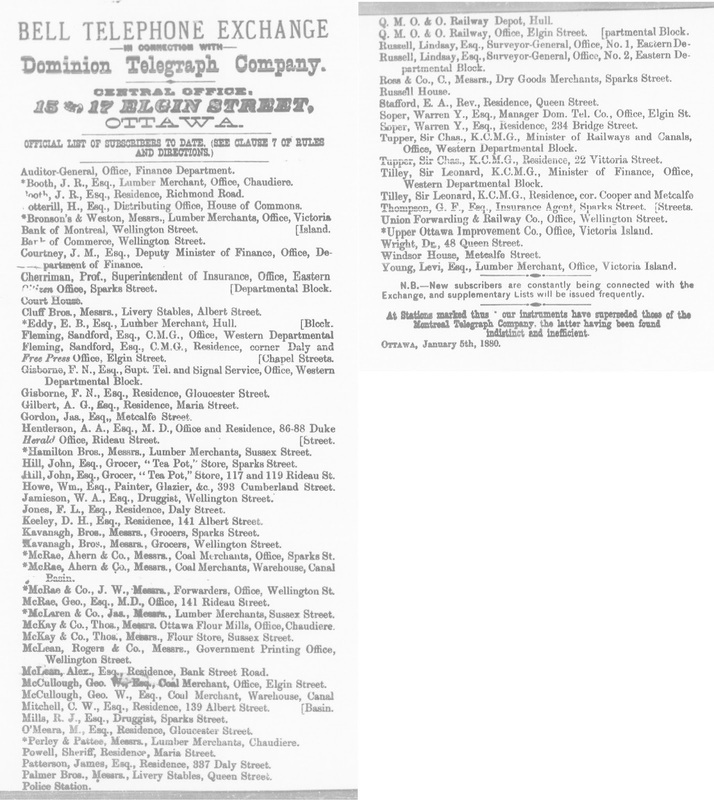 listing of every phone hooked up in Ottawa as of January 1880. By the 1880s, wall sets were developed which featured a double transmitter-receiver, so that a user could speak into the receiver and listen to the ear piece. The crank on the side would generate the power required to call the operator. 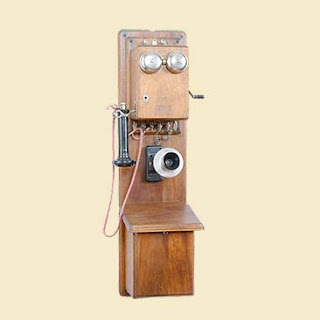 This type of phone was common until about the turn of the century. 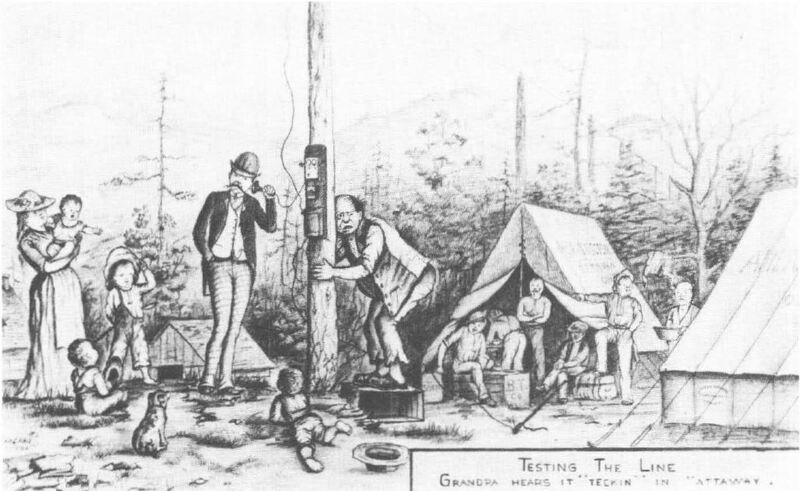 Thanks to the efforts made by companies like Ahearn & Soper, long distance calling became a sought-after advancement in the late 1880s. It was race by telephone companies to string up lines and establish links to then-distant towns and villages. The first external link was built to Hull and Aylmer, connected on May 29th, 1882, then later to Brockville and Pembroke in 1885. Ahearn and Soper literally "built" the system, heading out in the rough and running phone lines mile by mile. Thomas's brother Morris Ahearn made a series of sketches during the building of the Ottawa-Pembroke line in 1885, a real pioneering activity in the Ottawa Valley, when they threaded the line through dense forest bordering the original road to Pembroke. Harry Walker wrote: "Ahearn not only had to contend with the hazards of construction but with irate farmers who objected to this use of their land as a right-of-way. 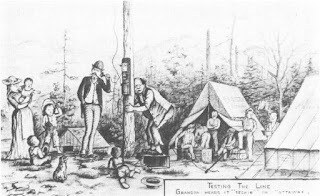 In particular they were disturbed by the spacing of the poles at the same distance apart, which sometimes placed a pole in a farmer's gateway or other irritating location...Also, as Ahearn progressed with his line along the old corduroy road he would frequently "call" Ottawa to test the newly-placed wire. When Ahearn "shinnied" up a pole to do this checking there would be a tobacco-chewing audience, to comment in expressive Ottawa Valley patois. The men camped in tents. They worked on a stretch of line, then moved their belongings in horse-drawn carts to another camping place. 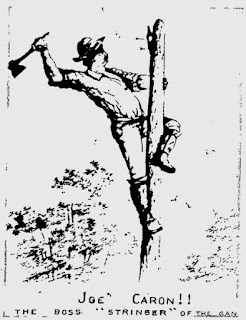 Those were the days when linemen peeled the bark off the trees they had cut down and erected them again by sheer manpower. 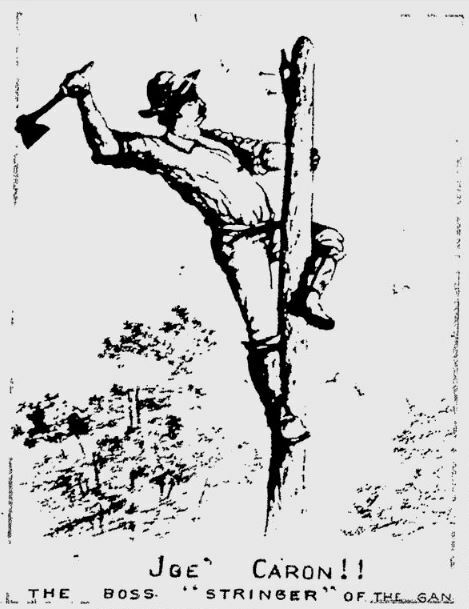 They climbed poles without safety belts, hooked a leg around the post and with an axe cut a groove near the top for the cross-arm. At that time the Bell company did not have regular installation gangs. Their installers were a rough and ready crew who toured the country working when and where it suited them. But though they were unaware of it, these men led by Ahearn were pioneering in one of the world's greatest and most utilitarian enterprises, with the Ottawa Valley as a proving ground." A particularly celebrated triumph in 1887 was the connection between Ottawa and Montreal. The first message carried over the line to Montreal was the result of a curling match in Montreal in which an Ottawa rink was participating (October 8th, 1887). Below is the first recorded instance of the telephone arriving in Kitchissippi I could find. It appears as early as February of 1896 that Hintonburg was looking to get connected to the city lines and it probably did occur around this time. I can't find anything else in the papers of the era to confirm when the first phones did finally arrive. But it (somewhat surprisingly) would be another 10 years until the lines would be extended out Richmond Road to hook up Ottawa West, Champlain Park, Westboro, etc. 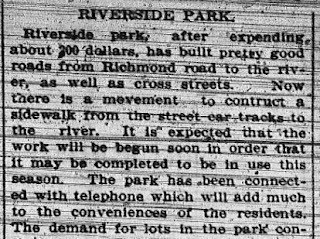 An additional mention of Hintonburg phone lines shows up in 1901, when efforts were made to install a telephone at the pumping station at Lemieux Island. In 1900, the new battery-powered desk phones first arrived in Ottawa, much smaller in size, and no longer required the user to "crank and grind", as the battery power was sourced from the main switchboard at the exchange building. Also, users no longer had to "ring off" at the end of the call to alert the operator that the call was finished (many users omitted this step, requiring the operator to frequently break in to check the call to see if the conversation had finished, and thus the line would no longer report as "busy"), and instead could just replace the phone on the hook. Small incandescent lights on the operator's board would be lit for each active line in a call. When the lights between a connected call go out, the operator would know the call was finished, and could remove the connection. Canada's first battery system went into operation in Ottawa on April 13th, 1900. 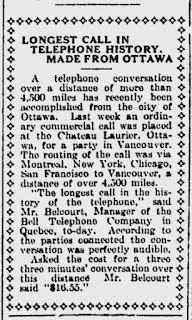 The longest telephone call in history was made from Ottawa in 1921, out to Vancouver. On October 3rd, 1927, Prime Minister Mackenzie King spoke by telephone from his office in the East Block to Rt. Hon. Stanley Baldwin in London, inaugurating trans-Atlantic service. Dial service was introduced for all of Ottawa on November 30th, 1937 (though it had been in use as far back as 1922, when a system was installed for the federal government in the Hunter Building to serve several departments of the civil service. ), and allowed users to make local calls simply by using a dial attached to their telephone. In 1953, a microwave system was first introduced, linking Ottawa with Toronto and Montreal, providing service for a TV link, and also capacity to carry hundreds of long distance calls simultaneously. The mid-1950s also saw the elimination of the "party line" system (still in use in rural areas at the time) whereby a line was shared by multiple subscribers, and thus neighbours could (and often did) listen in on others calls. Bringing the topic back to Kitchissippi, one of the last big changes for our area occurred in 1949, when west Ottawa became the first area of the city to have six digit phone numbers, including the new prefix of "72" (also known as the parkway exchange, or "PA"). Thus residents of this area, as many still do today, would have a phone number that begins with "72", but at the time was written/described as "PA-5726". This new exchange went in to use at midnight of July 31st, 1949. Within a couple of years, due to the overwhelming post-WWII demand, phone numbers were increased to seven digits, but still retaining the same prefix. showing the phone number with the "PA" exchange code. So there you have it, the story of the telephone in Kitchissippi, along with a bit of the background history of the phone in Ottawa. How exciting it must have been to use such a novel invention back at the time, for something we take for granted now. 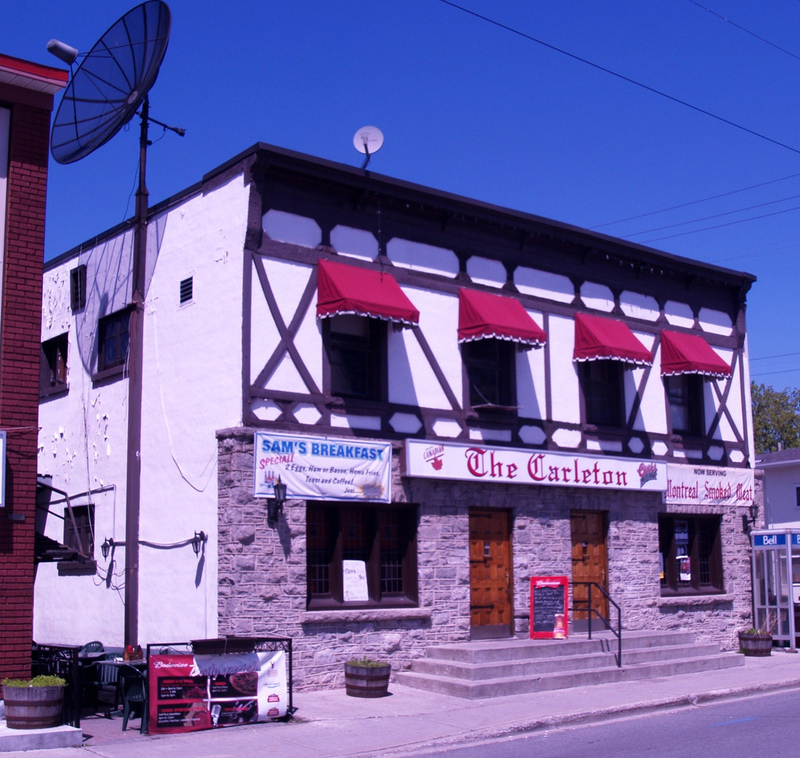 A vintage Carleton Tavern photo! One of the more elusive photos I've been searching for has been an old photo of the Carleton Tavern. For some odd reason I've never come across one in my years of searching. The City Archives has none whatsoever (there is an index which lists the existence of two photos taken in the early 1970s, but those photos are "missing" from the archives), nor any other source I've investigated. When I wrote up the history of the Tavern for the Kitchissippi Times this past spring, I was in touch with descendants of the former owners, and even that did not yield me a photo. 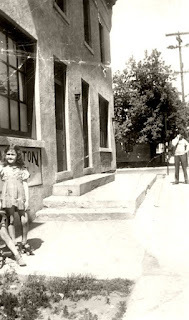 However by chance today, while googling around, I found a blog who had incidentally linked to my article, but their blog post included a photo of the Tavern from 1940! So I recommend you check out the interesting blog post about the Moran family, which provides even more details about the earliest days of the Tavern! It's funny how very little of the front has changed, including the concrete steps up to the raised entry doors!